I started my day today by withdrawing more money because I was down to change, and I needed to buy souvenirs. I tend to put buying souvenirs off for a few reasons, one of them is because I don’t like the feeling of spending that much money, but Lithuania is important to me. The whole walk from the place where I am staying, I argued with myself about the amount of Litas I should withdraw because there was one thing that I wasn’t sure I was going to buy. The walk was around 40 minutes to the bank that I used, so I was concentrating on this for a long time. When I got to the bank, I figured out that I couldn’t withdraw Litas unless they were in sets of full hundreds (I wanted to withdraw some hundred and fifty Litas) so I withdrew less than both of the amounts I had been considering because I didn’t want to withdraw too much. After I went to the bank, I went to a Chinese café to eat lunch (a very different place than the Chinese restaurant I went to before). The menu was all in Lithuanian, which is fine, but there were no English translations, which are very common for restaurants here. I asked the waitress the typical question of, “Do you speak English, или по русски (or in Russian)?” She spoke Russian, so I had the opportunity to practice my Russian a little bit. It was sort of like a game where I narrowed down what I ordered based on different sections that were on the menu (it was a very short menu because it was just for lunchtime). It started out with the soups, salads and hot meals all being separate categories. From there I chose the hot meals, so she told me something like vegetables, chicken, or fish. I chose chicken. The last question was about two different kinds of chicken, and I didn’t understand what the two words she said were. Instead of asking to try to figure it out, I picked one. I don’t know what I ordered even now, I guess I will never know, but it was good and it had a lot of vegetables. One of the things I had been thinking about buying today was shoes for the fall because, as I mentioned in an earlier post, I brought shoes for the summer and for the winter, but I guess I forgot that there was a season in between. Well, since I had been debating whether or not I would end up buying those shoes today since I had gone to a few stores and looked the day before, and I had time to look at more today, my mind was on shoes. I ended up going to more shoe stores today, and I did buy a pair of shoes even though I had withdrawn the amount of Litas I planned on taking out, were I not going to buy shoes. Because of the charges on bank accounts for withdrawing money at any ATM that doesn’t belong to that particular bank, I didn’t want to withdraw more money, so I thought I would try to make it on what I had. By this, I mean not withdrawing any more Litas for the few days that I have left here. There were two towers I had been planning on going to today, and one must pay to climb them, but I decided I wasn’t going to change my plans about climbing them just because I had an unsure amount of Litas for my future. It doesn’t cost that much to climb the towers anyway and I enjoyed doing it. The first tower I climbed was the bell tower outside of the big white church on Cathedral Square (I will include a picture of the outside and some of the inside for clarification). When I first entered the tower to buy the ticket to climb up, I encountered some people who were speaking English. They were considering doing the tour of the crypts that I had done, and climbing the tower. I told them I had enjoyed the tour, because I had, and proceeded on my way up the narrow stone steps. I must also mention that I was wearing a floor length skirt, carrying a bag with a shoe box in it in one hand, and carrying my purse and a camera in the other hand. I said in a previous post that I don’t like to wear jeans because they are restrictive, so I ended up in this skirt. On the next level of the bell tower, I was taking my time taking pictures and looking around, but the two people I had seen below had decided to climb the tower too. There was a guy who looked to be around my own age, and his mother. I was curious so I asked where they were from, and they told me they were from Toronto, Canada. I never asked their names, but the guy apparently had Lithuanian heritage from his grandmother too. He said that he knew a little bit of Lithuanian, but that because he hadn’t lived with his grandmother, he wasn’t fluent. When he was younger he used to go to Lithuanian school, and of course because he was a young child, he didn’t realize the value of this experience. 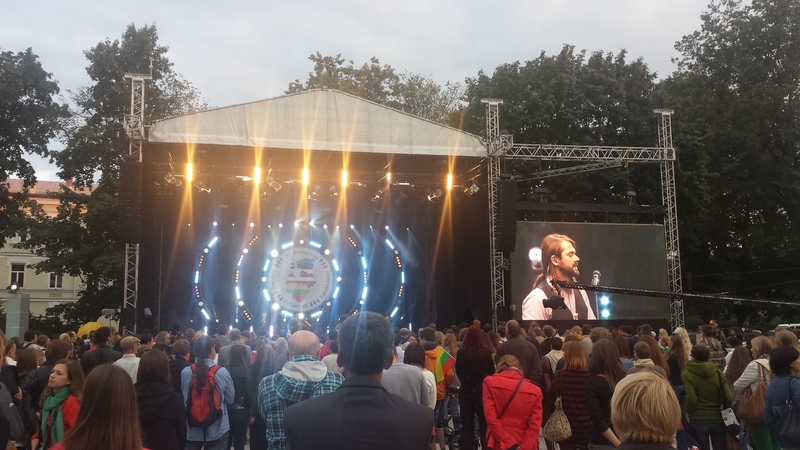 This was only their second day in Lithuania, so they had gotten a late start due to jetlag. As I continued up the tower, I kept talking to these two people, mostly the guy, and found that they were headed to Tallinn next because he also had Estonian heritage. Like I skipped over Poland to get to Lithuania, they were planning to take a bus through Latvia to get to Estonia. One of the things I was told on the bottom floor of the tower was to not ring the bells. I laughed, but of course the lady was serious. It was the same lady who had given me the tour of the crypts, and she has a very entertaining way of presenting what she is saying. My first host had mentioned that climbing the tower includes climbing up rickety wooden stairs while the wind is blowing through the windows and it is not very fun. That sounded fun to me, so I decided to climb anyway. At first I saw no wooden stairs. There were only narrow stone steps with closed walls, and no way for wind to get through. Later I found the wooden steps. The only difficult part of climbing them was my choice of clothing and everything I was carrying, but I actually didn’t have much trouble. The wooden steps came in sets. The first set was very long, and I didn’t realize how long and steep it was until I decided to climb back down. On the way down I realized it was more of a wooden latter than a set of steps because it was so steep. I enjoyed the climb nonetheless. Immediately after I had climbed up and down the bell tower, I headed towards Castle Hill (I found out this is the name of the hill with the ruins on it that the tale of the Iron Wolf is about). I continually climbed the hill until I got to the top, and although it is not a very tall hill in comparison to mountains, some parts of it are very steep to climb. When I reached the top of the hill, I couldn’t figure out if the tower was open, but I saw an elderly couple walk out, so I figured that they just kept the door shut to keep the cold out. The first set of stairs I climbed in this tower lead to a large round room with a map of some parts of Vilnius on a table in the center telling about key areas. There were also pictures of buildings during various stages in history. I, unfortunately, didn’t take as long studying these pieces as I should have because I was very confused. I didn’t see another set of steps that lead to the top, so I wondered if this was it. I knew I had seen people on the top though, so I continued to be confused. Everyone has mistaken me for being able to speak Lithuanian here for as long as I have been here, so the old man who was sitting in a chair to keep an eye on the room told me in Lithuanian to go down the steps and that there was another set of steps to go to the top of the tower. I only understood because of the context and gestures. The next set of steps was a tightly winding spiral staircase. It first leads to another circular room, but thankfully this room wasn’t confusing because the set of stairs that came after, was attached to the last. This room had old armor, swords and shields from Lithuania’s history. I did spend longer there, but it was a little odd being in the room because an elderly woman came out of a random room, looked at me, and went back in the room. When I climbed the rest of the way up to the top, there were a few people up there, but most of them left shortly after I got up there, so I had the top to myself for a short while. I realized at this point that I had no pictures of myself in Lithuania, so I decided to take a few selfies. A little while later a girl and her brother came up and were taking selfies together, then she asked in Lithuanian if I would take a picture of them, and they could take a picture of me. Somehow I understood, so I nodded my head. I got through the process without actually saying anything but “thank you,” in Lithuanian at the end, which Guoda had taught me a while before. Instead of taking a break after walking around and trying on shoes, then climbing two towers in a row, I immediately went to amber shops. Amber and linens are the biggest things in Lithuania that one should buy if they visit. I walked around a few amber shops, and bought earrings from two of them. In one of the souvenir shops I went to I found some beautiful scarves, and I saw the prices were 45 Litas. I remembered some other scarves I had seen up the street a ways, so I headed over there to compare prices. These scarves were sold at a street stand, so I knew the price would be either a lot more expensive, or a lot cheaper. 45 Litas is not very much in the first place, it is around 20 dollars, which is the typical price for scarves in the United States. I always thought scarves in the United States were overpriced, because they are really just solid pieces of fabric being sold for 20 dollars. These scarves were much prettier, so it would have been worth it to buy one for that price, but I decided I would check the other scarves I had seen just in case. It was getting late in the day, and some of the stands were already packing up, but thankfully the one with the scarves was not. The seller at this stand was an old woman. She talked to me in Russian and was very kind. She asked me about where I studied Russian, and let me try on different scarves to see how they looked on me. She also gave me her opinion on which scarves she liked on me, and which ones weren’t as flattering. In addition to getting a scarf for myself, I was looking for one for one of my sisters. Her coloring is slightly different than mine, but I hope it is close enough to make a good decision. I spent long enough chatting with the woman and trying on her scarves that she gave me a small discount, so I think she liked me. I quite enjoyed spending time talking with her as well. After I had finished buying a few souvenirs, I realized I had been continuously walking, climbing and standing for at least four hours, and I was tired. On the way back to the apartment, I knew of one more souvenir store that I had passed a few times that I wanted to look at because I still hadn’t bought a souvenir for my father. I didn’t spend very long in the store, but I noticed they had these ships made out of amber that were really interesting. The biggest one I saw cost 20,000 Litas because it was completely made out of amber, and amber can be expensive. When Tautvydas and Guoda came home, and we were eating dinner, we got on the subject of words in English that are spelled differently, have different meanings, but are pronounced the same. Maybe this isn’t the most important memory to mention, but the whole conversation turned into a game over dinner where we tried to think of different words like this. It is little memories like this for me, that just add to my experience and that I want to remember because we had a really fun time doing it. The next day I didn’t do much because I had to buy some snacks for the long bus ride that was in my future, and start getting my things together so I wouldn’t have much to do before I left for the bus. I returned to the shop with the amber ships, and spent longer there this time talking to the guy who worked there. I had the opportunity to ask some questions about amber, and I found out a little bit about the different colors of amber. White colored amber is the rarest form of amber that is sold in shops. Pure white amber is actually a nice creamy off-white color that is more expensive than regular amber. It is solid colored, and not glassy like one usually imagines amber. Sometimes white amber is sold when it looks yellow and not white. It is still solid colored, but it is not as pure, and can’t be sold for as much. The next rarest color of amber is green. It is glassy like regular amber, but when I have seen it, it always had a lot of bubbles in it, and the color of green is very dark, and not very pretty to me. After green amber is black amber. The black is solid like the white amber. So solid and shiny when it is cut correctly, that it looks like plastic. Again, I don’t like this as much. The most common amber is the honey-colored amber that is the most widely found. There is the darker one, maybe like fall honey colored, and the lighter one that might be more like the honey that is from the spring. I don’t know if there are any differences in the rarity of these, or if they are just both considered honey-colored. Even though it is the most common, I think the honey-colored amber is my favorite because the color is beautiful, and it looks really good in a silver piece of jewelry. The guy told me that the actual rarest color of amber is blue amber. I had heard of the term blue amber, but it never struck me that it was a real color for amber. Although, I really did not know much of anything about amber before I talked to this guy. I think I still could learn more if I want to look into buying more of it. In the end, when I got around to asking about the ship that I was interested in buying, I found that it was 625 Litas. I have no bartering skills at this point because it is one of the shortcomings of the culture of the United States. I left shortly after so that I could get food for the bus ride, and pack. I don’t think I ever reread this post, so please excuse any awkward sentences, or areas that don’t quite flow. I decided that this post needed to go up before it became irrelevant, so I am posting it now. I have to add a little bit more to what I said about the differences between service in restaurants in an earlier post. At times I really like the service in Lithuania. I was misguided by the service at chain restaurants. I went to the small Chinese restaurant, and I am currently at an Indian restaurant that is situated halfway underground. The service at places like this has been great. The waiters and waitresses don’t seem to come until you are really ready to order. This particular restaurant is not the most noticeable from the outside. It has some dishes posted outside the door on a poster that is lower than eye level because one must walk down steps to get to the door. I passed this restaurant many times and could never tell whether or not it was popular enough for me to try it. I was not disappointed. I think that this restaurant is vegetarian restaurant too because I don’t remember seeing any meat on the menu. It is a very nice place with the deep oranges purples and blues of Indian decorations and subtle background music that matches the theme. The waitresses are dressed in Indian saris, adding further to the atmosphere. Whenever I go to a restaurant in Lithuania, I have noticed that their translations into English are not great, but they are understandable. The dish I ordered was called something like “soy in tomato sauce.” The “soy” in this case means tofu, which many of the dishes had instead of meat. No, it was not just tofu in tomato sauce. Maybe the sauce had tomatoes in it, but it tasted like the nicely spiced sauces that go over many Indian dishes. Basmati rice and a side salad came with the main dish, which I was very happy about because I love basmati rice. I ordered some “spicy sauces” to go with my dish; it was really only one sauce. The sauce was a transparent, light amber color, sort of like the color of oil. At first I wasn’t sure if it would be spicy at all, but I was not disappointed. The sauce went nicely with the food, not smothering the flavor, but serving to enhance it. The whole restaurant was very decently priced so I decided to order a drink to go with my meal. They had a selection of fresh juices, so I asked for carrot juice. I know that sounds strange to some people, but I love carrot juice. Carrots are naturally so sweet that carrot juice doesn’t need any added ingredients to make it delicious. I remember in Kazan’ during the first week I was there, many of the students in the program and I went to the mall to look for things like dictionaries and internet sticks. While we were waiting for some of the people to finish making their purchases, my friend Katie and I found a juice stand. We didn’t know all of the names of fruits and vegetables but I ended up ordering apple-carrot juice. They made the juice right in front of us and the combination turned out to be some of the best juice I have ever had. Can I just say, I hate jeans. I know, “hate” is a strong word, but I’m serious, I really don’t like jeans. Especially jeans they make for girls today, how can anyone stand wearing them. To me jeans are not very useful, they are too hot in the summer and too cold when it is cold out, so when are people ever comfortable wearing them? They are also really constricting, like you can barely stretch your legs in them. I don’t like the feeling of being constricted, I like to be able to have free movement of my legs since I am an ex gymnast. I mean I can barely do a handstand in jeans, how awful is that? That’s probably why leggings are becoming so popular these days. I don’t really wear leggings because I have been perfectly comfortable in skirts and dresses and leggings look a little bit strange to me. This thought of jeans came about because today I am wearing jeans. I was thinking of climbing this bell tower they have outside the big white church on Cathedral Square. I don’t know for sure, but I heard that it’s a bunch of steps to get up to the top, and I love climbing stairs. I decided I would wait until another day when I am wearing clothes that are more comfortable to me. I walked around for a bit and ended up going to a café instead. While I was walking around I noticed a few interesting things. First, I saw a group of guys wearing coffee colored pants. I don’t mean coffee colored like black coffee; I mean the lighter, almost caramel color that it turns when you add a tiny bit of milk or cream to it. I wondered why so many people wanted this color of pants, and now in front of me sits a guy wearing a jacket that is the same color. It hasn’t just been these few people though, because the more I took notice of this particular color, the more people I saw wearing it. The second thing I noticed was a girl with bright violet hair, and when I say “bright,” I am not exaggerating. It was like her hair had something shining on it to make it so vibrantly violet. I have never seen violet or purple hair die that works that well. This reminded me of when I was staying with my first host and we were walking through Cathedral Square and we saw a guy with blue hair. If you decide to dye your hair blue or green, please be careful. When the color fades, the dye job looks terrible. Instead of looking like you died your hair, you end up looking like you swam too much and the chlorine stained your hair. As I was walking back to the apartment today, I saw someone with exactly this effect occurring to her hair and it was not pretty. I don’t often see people with hair dyed strange colors here, so it is very memorable when I do. Sitting in a coffee shop today I noticed that there always seems to be a group of people in a coffee shop that speak a little too loudly or laugh too crazily for the general coffee shop atmosphere, disturbing everyone else’s enjoyable coffee drinking experience. If you buy coffee from a coffee shop, you probably want to take the time to enjoy it because it’s more expensive than putting a pot on at home. Well sorry you can’t, there are people here to disturb you. I remember the disturbing group when I was in a coffee shop here before writing. It could almost be told as the beginning of a joke. Once there was an American, an Irishman and a local… the American was really loud like Americans often are, but he was so audible over the rest of the chatter that I just wanted to tell him how rude he was being and to shut up. On a brighter or darker note, depending on how you choose to look at it, I went to another museum yesterday. Yes, it was another holocaust museum. I liked this one better than the last, probably because my experience excluded the two boys practicing a tour. Although, there was one unfortunately memorable incident in this museum, with an old man who kept showing up in the same room as me, chewing his gum really loudy. It was awful, and the sound drove me crazy. Again, I spent over an hour in this museum, and I really enjoyed it. Any Holocaust museum or history of the Holocaust taught in the United States doesn’t take into account small countries like Lithuania. The history is always about how terrible Auschwitz was, and Nazi Germany. I am not saying those weren’t terrible, they were, but after spending some of my time in Lithuania in these museums, I see how much history our educational facilities and museums leave out. The Lithuanian people suffered from the Holocaust plowing right into them, and the Soviet Union claiming the country as its own, all in the space of a few years. People from Lithuania ended up all over the place, and over 90% of the Lithuanian-Jewish population was wiped out during the course of the Holocaust. The only reason those other people were left behind were because they were skilled laborers and it was decided that they were needed. There were plans to wipe them all out in the end, but thankfully someone stepped in and said that these people were still useful. The “cleanse” of Jews from Lithuania was considered the most successful to the Nazi’s. (This is the first room one encounters as they descend into the prison. They had two of these rooms next to each other that were used to hold new prisoners for up to three hours while their paperwork was being processed. Originally the cells didn’t have seats so the people had to stand. The seats were added later). (This is the strip room. It is pretty self descriptive, but it is where prisoners had to strip down to make sure they had nothing that wasn’t allowed on them. Originally prisoners were than only given one set of clothes that they wore both during waking and sleeping hours. Later this changed). (There are a few of these rooms open for viewers as they make their ways down the long hallway. This is what a prison cell with basic furnishings looked like. The furnishings only came later though. Originally the cells that they held prisoners in had no furniture, so the prisoners would sit on the floors of the very damp cells, crammed together with many other prisoners. This room has four beds, but I remember reading that before there was furniture, I think somewhere between 20 and 30 people would be held in one room). (While walking down the hall, there are comforting signs that lead the viewer into another hall to view the execution chamber). (This is descending even further down than the prison, I think, into the execution chamber. The execution chamber is interesting, but also unfortunately, very redone to be more of an exhibit than what it used to be. The whole floor is glass and it has little remains – maybe a comb, maybe a nail, etc. – of people who had been executed, placed under the glass). (This is a room that has bags of shredded paper. The shredded paper is some of the remains of thousands of documents that the KGB attempted to destroy before they were forced to stop operations in the country). (This is a picture of the hallway. It is underground so it is cold, and the colors obviously don’t make it very inviting). (This is a padded room with a straight jacket against the back wall. 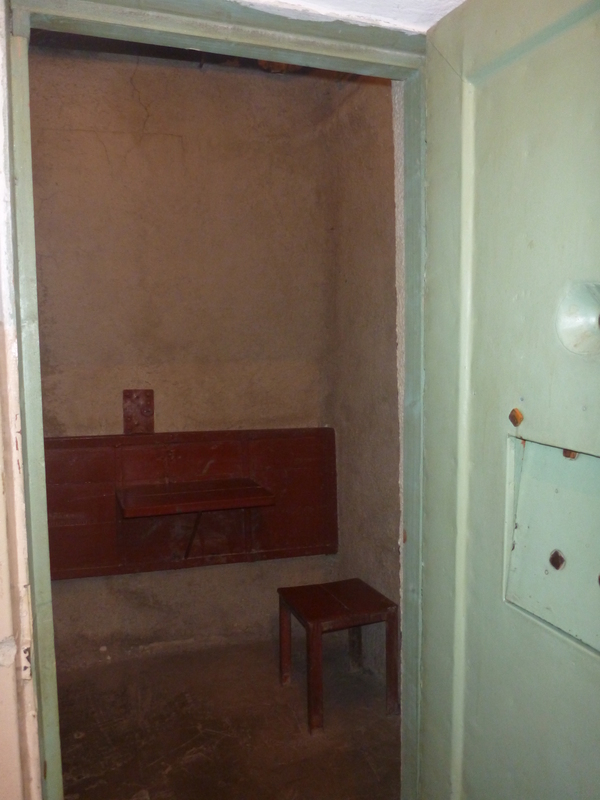 Sometimes prisoners would be held here after “active interrogations,” one of the terms they used to refer to torture, because the prisoners mental states were not always in tact). (This is the door to the padded room. I took it so that people could see how thick the padding is). (I think this is a room they used to hold people in before interrogations so that they could not communicate with other prisoners. I think that the placard said that sometimes they would be held here for up to ten days, just being fed bread and warm water. There is a toilet of sorts in another corner of the room). (This is a chamber where they put people who wouldn’t cooperate during interrogations, to make them cooperate. The floor would be filled with water up to the white line, so thee prisoner could either stand directly in the water, or they could stand on the circular plate in the middle of the floor that was raised above the water, and every time they fell off, they would have to get back on). I am not going to go on about the museum and the Holocaust in Lithuania because there was too much information to recount. I will just say that one of my favorite parts of the museum (the building was a center for KGB agents with a very active prison underneath it during the Soviet Union) was being able to go down to the prison, and basically explore. It wasn’t like a maze or anything, it was a straight hallway, but to me, being able to walk in a place like that without a tour guide, and read the signs and experiences of people down there for myself, and just take the time to image it without having my thoughts interrupted, is one of the most memorable ways to experience something. Last night it took what felt like forever to fall asleep. I spent a lot of time staring out the window and thinking. I knew that the next day was the day I was supposed to get my passport back with my new Russian Visa, so of course I was worrying. This morning I woke up too early, but I eventually got myself to fall back asleep for a small time. When 9:00 A.M. rolled around, I waited for a bit, but I quickly checked my email to see if the visa center had emailed me. I wasn’t sure if I was supposed to just walk in and assume they had my passport already, or if they were supposed to contact me and let me know somehow. Why else was the lady at the desk so persistent about seeing if I had a working phone in Lithuania or not? It made no sense. Time passed and I still received no email. I ate breakfast and showered, worked on writing a little and waited. When 12:00 came and went I decided it was time for me to email the visa center to see what I was expected to do. I immediately got a response and was told I could just walk in and pick up my passport. Of course, things are never that simple. It took me about 45 minutes to walk to the center, but I enjoyed a new view of Vilnius since I decided to take a new route. When I got to the center, at first I wasn’t sure who I was supposed to ask to get my passport back. When I did find someone, they asked me if I had the agreement that I apparently signed when I gave them my documents in the first place. My immediate thoughts were I signed what? What agreement is she talking about? I vaguely remembered signing something, but everything has been so stressful, how am I supposed to remember one piece of paper? Thankfully when they gave me the papers, I put them inside a book inside of my bag so that they would stay in decent condition, and they hadn’t moved since then so I had the agreement with me. It just took some shuffling through papers before I found it. The second hiccup in the process of getting my passport back was in part because the lady I dealt with today was different from the one I had been communicating and meeting with at every other point in the process. I had turned in my AIDS Certificate as I was supposed to about five days ago, honoring another agreement I signed that said I would turn it in before I received my passport back. Apparently the AIDS Certificate was not attached to the rest of the papers that accompanied my passport, so the lady helping me today at first thought I hadn’t turned it in. Thankfully she found the copy of the certificate, but I never go places like this unprepared. I had made an extra copy of the certificate just in case I needed it. One thing I have learned on this trip is just to have two or three copies of every important document, because you honestly don’t know if or when you will need it. It has been very helpful to me since I had to turn a copy of my passport (the identification page) in to the visa center with my other documents, and when I went to get my HIV test, I had to use my other copy of my passport as a form of identification. Now I am left with only one copy of the passport since the visa center took one, but one copy can be so useful. I am happy to say I have my passport in hand with my new visa pasted inside. However, I will also say this, after so much time of not having my passport, or preparing for this time, I literally have my passport for about five days before I will give it to people running my program in St. Petersburg so they can start the process for the visa extension. Right now though, I am not going to worry about that. I am going to concentrate on having a grand time during my last few days in Vilnius, and then the process of my return trip to Russia (back through Poland and Germany). When I got my passport back, it was around 2:00 P.M., so afterward I realized I was really hungry. I returned to a street for lunch that I had been to before, but I knew this street had a few souvenir shops, and I decided it was time for me to start my souvenir purchases. I like to go into shops and look around some days before I actually buy any souvenirs, if I have time, so I already knew where one particular shop was that I wanted to visit. I ate at a restaurant close to this shop, and one of the things I decided to order today was a glass of beer in celebration of my getting my passport and visa back. I found out much later (after the next series of events occurred) that September 1st is a holiday in Lithuania as well as the United States, but they are two very different holidays. Apparently in Lithuania on September 1st, it is a law that they will not sell alcohol. I think that this is just in stores though because I saw many people at the restaurant I went to, with a beer, so it must be okay at restaurants because they can moderate how much a person gets. The reason for them not selling alcohol is because September 1st marks the start of a new school year, and it is a huge celebration where (I am told) all of the students dress up and carry flowers or something, and they don’t want the students to get drunk. (These are not just elementary school students; they are secondary school students and university students as well). Guoda told me that of course this ban on selling alcohol doesn’t work, because the students will just buy it the day before since they know they won’t be able to get it the next day. I had no idea about this holiday when I was out today, so the next series of events ensued. As I was looking around in the shop again, and collecting a few things I wanted to buy, some loud noises coming from the open street started penetrating the peace of the shop. I stepped outside to see what was going on, and viewed what appeared to be some sort of parade. In the beginning it was typical, just a group of girls in the front in a uniform, and a marching band following them. I didn’t see any uniforms after them, so I was confused because there were still a lot of people walking in the same direction as the band. As I continued to watch I started to see people with the German flag draped around their shoulders, or painted on their faces. The Ukrainian flag, French flag, Latvian flag, Italian flag, and so many more were all there, including some that I did not recognize. After a short time, I decided it would be safer if I went back in the shop and continued my browsing of souvenirs for the duration of the parade because some of the people had started walking on the sidewalk, and one guy decided it would be funny if he shoved his flag in my face. It was not funny, and I thought later that I should have just taken it out of his hand because it was a very rude action on his part. The parade continued past the people cloaked in flags from various countries onto what I later figured out were groups of people in different specializations because the parade was of university students from Vilnius University. Maybe the flags represented some sort of international studies specialization, I don’t know. I only recognized a few of the specializations because the words sounded similar either to those in English, or in Russian, or because their costumes gave it away. A few of the specializations I recognized included psychology, chemistry, and what I could only assume was premed. As the groups passed, they were all chanting. Of course I have no idea what they were saying, except that it was about their specializations, because it was all in Lithuanian. It was an interesting event to witness nonetheless, even though I watched the majority of it from the inside of a souvenir shop. Now, returning back to the topic of my visa, I think I can say this safely since I have my passport and visa back. I am happy to say that it can be done; a U.S. citizen can successfully apply for a Russian visa outside of the United States. However, if I never have to go through this process again, I will be very happy. If I do have to go through this process again, I got through it successfully this time, so I know I can not only physically getting the paperwork together and carry it with me for months before I actually have to submit it, but I can mentally endure the strain and stress that the whole process can put on someone. Yesterday was Sunday. I didn’t really make plans for Sunday, partly because I assumed that most things would be closed, which was for the most part true (since I had been considering looking for shoes, but I thought another day would be better for shoe-shopping because more stores would probably be open on a day that wasn’t a Sunday), and partly because I only have a few days left that are not planned. Pretty soon my schedule will be as full as it ever was, with classes and excursions that I must attend. I did, however, decide to go to a restaurant that had some good reviews on Trip Advisor. When I read reviews on Trip Advisor, I usually look for information concerning whether or not the food is good and decently priced. I don’t look passed that because I want the general atmosphere of the restaurant to be a surprise, and I don’t want to have preconceived expectations based off of what other people have written, to ruin my experience. The restaurant I went to yesterday, reportedly had a combination of foods from various countries, including Thai food, and I felt like eating Thai food, so that’s what I went for. The restaurant was called “Briusly,” in Lithuanian, and I didn’t realize until later what that meant. Guoda had taught me how to read in Lithuanian, but it was just such an odd name for a restaurant that I didn’t initially make the connection. Another problem was that for the name if this restaurant, the name used had been combined into one word, when it is usually two. In English, the name I am referring to, and that the name of the restaurant translates to, is Bruce Lee. My whole experience with the place was rather strange, and not very pleasant. When I entered, the inside of the restaurant smelled like stale cigarette smoke, but I could barely concentrate on the smell because the music was so loud. For the most part, people came in groups, as people often do when they go to restaurants, but I don’t know how they managed to hear each others voices over the sound of the music. The music wasn’t necessarily bad, it was interesting, it was just too loud for what I would expect to be played in a restaurant because it didn’t encourage communication and conversation. In Lithuania, from my experience, people always seat themselves, and a waiter or a waitress will bring them a menu once a new person’s presence is realized and acknowledged. So, once I sat down, I started to look around. The first thing I noticed was that the tables already had menus on them, thus eliminating one of the steps I have become accustomed to in Lithuanian restaurants. The second thing I noticed was that the walls were adorned with pictures of Bruce Lee. I don’t know why anyone would open a restaurant and decide that the decorations should all be pictures of Bruce Lee, but I guess that someone must really like him. I wonder if the photographs were chosen because of the name of the restaurant, or if the name of the restaurant was chosen because of the interesting decorations. I won’t wonder for too much longer about it though, because I think it is just another case of the chicken and the egg. If you don’t know what I am talking about, ask yourself; what came first, the chicken or the egg? When I first arrived, there weren’t many people in the restaurant, but as I ordered and waited for my food, the restaurant filled. I noticed that most of the people who chose to eat there were around my age, maybe they were university students or people who had recently graduated. I guess with the music, the smell and the decorations, the restaurant seemed to be geared towards a certain age group. There was one family with very young children that I saw come in to eat there, but that was it. Another piece that contributed to the restaurant’s atmosphere, that I didn’t like, was that the waiters kept walking around so quickly, and not close enough to my table, that I couldn’t stop one to ask for a check for about ten minutes. I just sat there drowning in the commotion, and I know they saw me there waiting, they could have come over and asked if I wanted anything else. I mean, maybe if I had yelled “CHECK,” they would have heard me, but I was trying not to be rude. I made a note to myself never to return to this restaurant again if I ever had the opportunity to go on another trip to Lithuania. I still feel the same about my experience at this restaurant today. I slept on the story for a night to let my thoughts cool down a little bit, but I think the only difference is that I am not mad today, I am just disappointed. But, what would life be if we didn’t have disappointing experiences to compare our good experiences to? I am sure that I had other experiences, in addition to this one, yesterday. I am just currently not recalling what those might have been. As my time in Lithuania draws to a close, the days have started speeding by, and I think my memories are blurring together. That is part of the reason I started this blog though, to keep my memories sorted out because I don’t want to forget this year. Today I am so tired and I haven’t done much of anything. I think it is because I was so stressed out yesterday. August 26th is the birthday of two of my immediate family members – my father and my youngest sister. My father has been very busy, but I was going to try to Skype them both if I could. On top of trying to deal with the time difference, the fact that neither of these to family members really uses social media or replies to their email often (which are the only ways I can contact people right now) makes it so I have to coordinate everything through my mother who is also busy and I had to calculate another time difference to attend my online orientation for my upcoming study abroad program. I forgot a few pieces. As I was still attending my online orientation Guoda and Tautvydas came home and I felt very rude because I could not fully concentrate on what they were saying when they were talking to me because I had to listen to a person I could not even see on my computer. They also were preparing dinner (another delicious pumpkin) because they were inviting a friend over to eat with them. There I was, still on my online orientation and trying to figure out when I could talk to my family while all of this other stuff was a swirling mass of business around me, or maybe just in my head. I think all of these things together stressed me out too much. I have probably been stressed too much this whole trip (since I left the United States) trying to get everything to run smoothly so I would be able to go to Kazan’ and St. Petersburg, and now as soon as I get a little bit stressed I wear myself out by over stressing. In the end I didn’t get to talk to either my father or my sister for their birthdays. I had to give up and ask my mother to say happy birthday for me. At the time I felt so defeated by having to ask someone else to say happy birthday to my own family members for me! I felt like it was such a pathetic thing to do, and I felt terrible for having done it. In reality, it was not my fault. I did try to be able to talk to them. All of this stress from last night traveled over into the morning. This morning I did not want to get up, I did not want to eat breakfast, I did not want to work on my blog, and I did not want to start my day. I did not post anything yesterday and I told myself that because I had time in Lithuania, I have to try to post something every day to try to catch up from not posting anything while I was in Kazan’. I am working on a few posts that concern my time in Kazan’, but they aren’t finished so, I missed a day. I did eventually drag myself up to take a shower and work on my blog. I didn’t get out of the apartment until lunch time because I was writing, but I told myself I had to go somewhere to eat lunch so I would get on my feet and start walking. There is a small Chinese restaurant in the area that I am staying. When I was walking with Tautvydas and Guoda they told me that they had not been there because it seemed suspicious to them. It is in an old, blue wooden building that looks like a house. The paint is peeling and faded in some areas, and you can barely tell from the outside that it’s a restaurant. The only indicating factors are the smells that waft through the window every time I pass by and two Chinese lanterns hanging from the corners of the patio cover. It is probably semi-new because it does not show up on a map if you try to look it up. When I left the apartment for lunch today I decided I wanted Chinese food so I went to look inside of this restaurant and told myself that I would find another place if this hole in the wall Chinese restaurant didn’t look appetizing enough to me. I shouldn’t have even questioned whether or not the restaurant was good. I haven’t been to other Chinese restaurants in Vilnius, but the places that are hard to spot are usually the best. Upon walking inside I discovered the restaurant was almost full. It wasn’t a very big restaurant, but it says something about a restaurant, especially when it is not easily noticeable, when it is full. I took the last table, a two person table that was situated right in front of the door, leaving about five feet for people to enter and stand in between the table and the door. During the time I sat at this table waiting for my order and eating my food, I observed many groups of people coming to the restaurant for lunch hoping there was an empty table. I ordered fried rice and sweet and sour chicken, which are two of one of my sister’s favorite dishes when we go out to eat Chinese food. I knew they weren’t going to taste the same, but I wanted something vaguely familiar so that I could compare the different flavors with those that I remember from places at home. Although the inside of the restaurant was decorated with Chinese decorations, a blonde and obviously Lithuanian, waitress took care of my order. As I started to look around and listen, I noticed the restaurant was playing old American rock music instead of something that would create an atmosphere more representative of China. I seem to experience strange music with restaurants that serve international food often though. Not only abroad, but also in the United States. It is sort of like the people running the restaurant aren’t quite sure what music would make an appropriate match with the food and the decorations to create a full picture. I think (I am not sure though) that this restaurant was the first place I have been that hasn’t been packed with tourists. I believe I was the only one in there who was speaking English (although I immediately switched to Russian when the waitress didn’t at first understand me). Tourists from other countries normally speak English here because, as Guoda said, it is a common language between small countries. Again, when I spoke in Russian to the waitress, I realized that even though English is widely used, it is better to know another language, too so that one can have more opportunities to communicate with the rest of the world. I have written little bits here and there from the last few days, but none of them were really interesting enough to post by themselves. I still don’t know if they will capture your attention, but perhaps they will provide further insight into who I am and how I think of people and the world. I wonder if you know, today is Ukraine’s Independence Day. 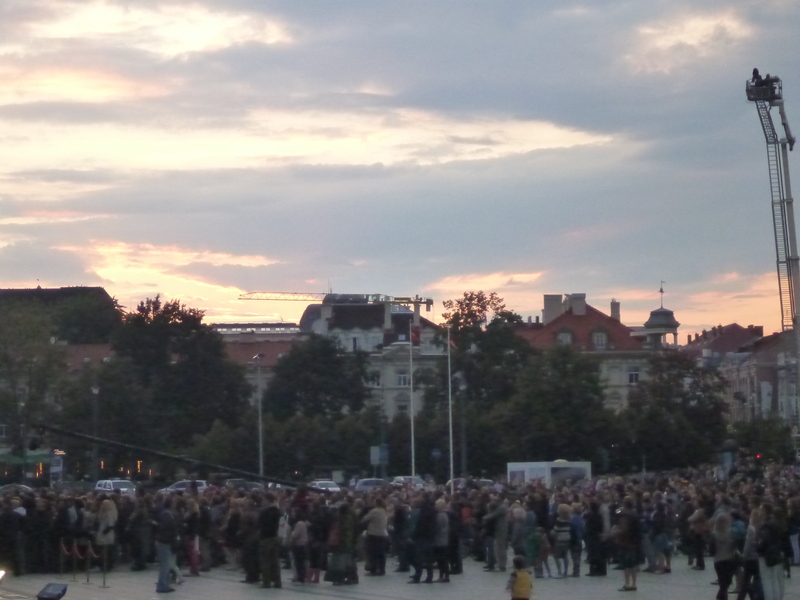 In Vilnius’ Cathedral Square last night they had a bonfire to show support. 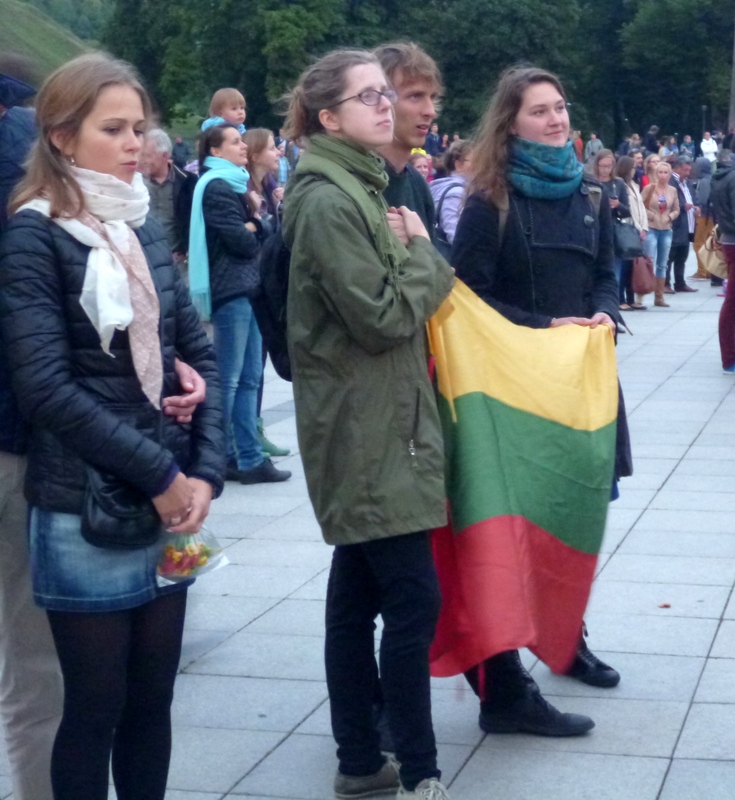 I mentioned in another post that yesterday the Baltic countries also celebrated the 25th anniversary of the human chain. It is really rainy today in Lithuania, but I wanted to get out of the house since I feel like I have been there every time Guoda and Tautvydas are there and perhaps they are getting tired of me. Unfortunately, because of the rain, I could not go very far so I ended up at a mall that is about a ten to fifteen minute walk from where I am staying. I am now sitting at a café and observing some teenagers below me. They are sitting on a mesh contraption shaped like a couch. There are two girls and one boy. The girls appear to be friends, and the boy is one of the girls’ boyfriends. The boy is sitting with his arm around his girlfriend’s shoulder doing nothing but occasionally looking around and even less frequently interacting with his girlfriend’s friend. Both of the girls are texting (I assume), or doing something else on their phones. The typical head bent over and slouching back of a teenager caught up in social media, has taken over their posture; I know because I was a young teenager with a new cell phone once too. The girlfriend is paying even less attention to her boyfriend then the friend is, and I can tell the boy is starting to get bored. This situation is sad to me. I have observed the children and their mothers in a park, and how free they seemed, but now I am seeing much to my disappointment that in this situation these teenagers are no different than the wired in teenagers of America. (Yes, if you are wondering, I do realize I am sitting here typing on my computer working on my own form of social media while I complain about what I am seeing below me, but I am also not here with anyone but myself). It is now the next day from when I was sitting in a café at the mall and writing. Yesterday was very rainy. When I left earlier to go to the mall, there was only a cold drizzle that fell from the sky. As I sat at the mall looking out the window, I watched as the drizzle turned into a downpour and I wondered when I would be able to return to the apartment. They have a restaurant at this mall called La Crepe that I decided to try since I was temporarily stuck there. La Crepe is a chain restaurant and I have seen them allover Vilnius, but chain restaurants are part of a country’s culture (unless it is McDonald’s, Burger King, KFC, or any other American fast-food chain that has managed to make its way into another country). I have noticed that many restaurants here serve crepes or pizza, and of course potato dishes. Pizzerias serve crepes, and La Crepe serves pizza. It is a very strange combination, but if that is what people like, I cannot argue. I enjoy both of them myself if they are good, I just never pictured them having a place on the same menu. An ambulance just drove by, and it reminded me that in Kazan’ my host mom had asked me why ambulances sometimes have the word “ambulance” written backwards across the front of the car. I had no idea that this happened, but we looked it up and found that it was so cars driving in front of it could read what it was in their mirror and get out of the way. Today I encountered a man from Malta. When I ran into him, I did not really have a direction that I intended on going. I had plans for later in the day but right then I was just enjoying walking down the street by myself and enjoying the city. I was about to keep walking on my way but he started talking to me. In the beginning I knew little about Malta, only that it was an island. In all honesty there are so many countries out in the world that I can’t possibly know about every single one of them, and Malta was one that I did not know. I study Russian and in accordance with this, I study mainly the history, culture and literature of countries that speak the Russian language or that were part of the former Soviet Union because they have intertwined histories. The man and I went to a café to chat a little before he had to take off to fulfill his prior commitments. He was only in Lithuania for a few days gaining a visa to Belarus. He is leaving for Minsk tonight. The Baltic States are not only beautiful hidden pockets of culture and history, but they also serve as very useful gateways to apply for visas for surrounding countries. We talked about a few different topics including Russian and Russia of course. These topics seem to always come up in conversations when I meet someone. Through this conversation I learned that people in Malta are bilingual speaking both Maltese and English. Later, when I looked up a bit of information about the country I found that these are both official languages of Malta. In addition to these two languages he mentioned that he learned Russian and Arabic. Perhaps another language as well, but these four are what I remember. I don’t know the story behind his interest in Arabic, but we talked about how and why he ended up learning Russian. In Malta he used to own a restaurant and he would get a lot of Russian clientele. A Russian woman ended up working for him and suggested that he translate the menu for his restaurant into Russian. I wasn’t very clear on this point, but I think that this was before he knew Russian so this woman probably helped him. He also spent a few months in St. Petersburg and said that while being there, hearing and seeing Russian everyday it was hard not to learn the language. At his restaurant after he learned Russian, his Russian customers would always wonder why and how he knew Russian. From this, we moved on, to a discussion of differences in restaurant etiquette in Malta, Lithuania and America. I have discussed a few differences in education, fitness and the grammar of languages; I never thought I would end up in a conversation about the differences in customer service at restaurants. He said that in Malta if the restaurant was a good restaurant, not necessarily expensive, but good, you will always find the real owner at the restaurant. Since he has been in Lithuania he has not seen the real owner of a restaurant here, although most of the restaurants I have seen here are chains. From my experience in Lithuania when you sit down at a restaurant they give you about two minutes to look at the menu before asking if you are ready to order. Sometimes these menus are around twenty pages long (with the back section usually being beverages or dessert) so I have had a waiter or waitress come back sometimes three or four times before I am actually ready to order, or else they hover nearby ready to pounce as soon as I look up from my menu. I know that in the United States the staff at restaurants will annoyingly return before you are obviously ready to order as well, but not in the same short intervals that they do here. In the United States sometimes people take a long time to decide what to order and this is normal. We like to slowly examine each dish, and chat about something interesting while we are doing it, so it makes going through the menu much slower. People that I know usually go to restaurants to spend time with people, catch up with old friends, or meet for the purpose of business. The point is to talk over a meal. I have never been to a restaurant in the United States just to eat. I think the only other noticeable way that restaurants in Lithuania differ from restaurants in America is that like many European restaurants, they will not give you your check unless you ask for it. In the United States, as soon as they see that people have set their forks down they walk over with the check as if they want you to leave. This man I met made a comment that we are both from more relaxed countries than Lithuania based on how quickly we choose what to order from the menu. I tend to disagree, having spent about a week in Lithuania now, and I think that the country is rather more relaxed than the high speed culture of America (I of course cannot speak for Malta), but like the exercise and education differ between countries, so do the expectations in a restaurant. This expectancy of high speed decision making extends to cafes as well. In the United States I will stand at a Starbucks (or another coffee shop) for ten minutes deciding what drink I want to order. I of course will not stand in line while I am trying to make up my mind; I stand off to the side and let others go before me if they are ready. In Lithuania, even if I stand off to the side to examine the list of drinks, the barista stares at me, waiting. Maybe here people make quick decisions concerning their food and drink. I like to know my options and enjoy knowing that I am making the right decision for myself when it comes to what kind of food I put in my body. I can’t say too much more about this man, most of what I know about him is information I filled in myself. He gave me only little bits of insight into who he was because he kept choosing to interrupt the conversation or stop talking. It was very frustrating for me, but some people choose to be like this and I cannot change that. Over these last few days, although the sun still peaks through the mass of gray clouds on occasion, the bite of fall is in the air. Fall is my favorite time of year, but adjusting from summer clothing to those required in autumn is always difficult. As it is I seem to have forgotten to pack a pair of shoes for the time in between summer and winter, and at the moment I am left wearing my summer sandals through the rainy and windy days. I think wearing my summer sandals in the rain and cool air yesterday took my body heat, for when I went to bed I could not easily fall asleep because I was so cold. Instead I stared out the window across the room from my bed and noticed a pale green light that slowly faded in and out, in and out. Since I had nothing better to do while I waited for sleep to take me, I started to create a story stemming from the green light. I started thinking of aliens because of the color, and thus the story began. In an apartment across the way lives a seemingly normal family. They have two children, as is common with families today. The young boy names Lynas and the older girl called Leanna attend school as anyone their ages should, and the parents go to work. On a normal day, when they all come home in the evening, the mother makes dinner while the father helps his children with their homework. Life went on normally for them, but for one difference. In the depths of night when they thought the city was sleeping, a green pale light throbbed from their windows admitting an eerie glow on the buildings and streets around it. What did this light mean? No one knew. Everyone who saw it covinced themselves that their eyes were playing tricks on them and the light wasn’t real. They thought they must have just been too tired to think clearly and never mentioned the incident to anyone. However, one day a girl in Lynas’ year was walking home with her mother. Her mother had had an evening shift working at a hotel, and her daughter had come to visit her. By the end of the evening shift, the mother was very tired, so when the green light started throbbing in front of her eyes, she didn’t think much of it until her daughter pointed it out. I didn’t get very far in the story, or else I don’t remember the rest. That’s what I came up with last night though, Perhaps I will write more if I ever have interest in doing so. Today I went back to the first restaurant I went to in Lithuania when I was staying with my first host in the hopes of trying a new traditional dish. However, when the translation on the menu reads something like “boiled,” “fried” or “stuffed pig’s ear”, it just does not sound appetizing to me, so I did not get it. After lunch I started to head in the direction of the museum I wanted to go to yesterday, but the weather was cleared up enough that I decided it was time to try another interesting flavor of ice cream. This time I tried Marzipan with fruit or something. After I ate the ice cream I still had time to go to the museum, so I headed on my way. Unfortunately I don’t know all of the streets in Vilnius well, so I got a bit lost, but I eventually made it there. The museum was more of a story, you go from room to room reading about how different parts of the holocaust affected the Lithuanian Jewish population. There are pieces of the story told from the point of view of the those who administered the harm, and many diary entries from those who suffered. I think I was already slightly worn out when I got there because I had been walking around all day, but I planned to take my time going through the museum anyway. Unfortunately, as I started to make my way through the first room, two younger German guys started to practice as if they were giving a tour to people who spoke English, and I could not concentrate on what I was reading. They carried on like this the whole time I was in the museum (which was over an hour) and I was so frustrated by the end of it because I knew I could have gotten so much more out of the museum. I don’t know if you have noticed that quite a few of the pictures I have posted of churches, the outside of the churches have been pastel peach in coloring. (I will include some pictures just in case you missed this). My current hosts told me there is a reason for this. Lithuanians apparently love the color peach for houses. They want the inside and the outside of their houses painted peach because it is a warm color and they live in a cold country. My hostess, Guoda, is an architect. She told me that once the company she works for was building three houses that were exactly the same, but they were going to paint them different colors. The colors were going to be green, yellow and blue. However, the agency that would sell the houses told Guoda’s company that they could not paint the house blue because Lithuanians won’t buy blue things; it is too dark of a color. I returned to the apartment around 7:00 P.M. this first Friday because I was meeting with some friends. At first I thought I was at the apartment alone this first weekend because Tautvydas and Guoda told me that they were going to do an experiment where each of them would write fifteen things they could do on different slips of paper and put them all into a hat. They would pick one out of the hat and leave right after work to do whatever activity was chosen. I don’t know why I didn’t think of doing something like this with my friends in California because Sacramento does not have much to do, but with many of us driving now, this experiment could solve our problems. Guoda told me when they got back that they had gone on their first date. Apparently they skipped the whole dating stage and just became boyfriend and girlfriend. I am glad they had the opportunity to go on their first date because it is my opinion that if you are in a relationship you should never stop dating. My parents have been married for 25 or more years, and they still occasionally go on dates. Some information I have learned from Tautvydas and Guoda. Vilnius is one of the only cities where you can still take off from inside the city in a hot-air balloon. They apparently have done this because it is an attraction that is available in a park not far from where they live. The attraction is obviously expensive for an attraction, but they said it is inexpensive for a hot-air balloon ride because to fly in other places costs much more. I would do it if it weren’t so expensive, but I feel that I am already spending so much money on this trip that I can’t put that burden on my parents too (since I have not had the opportunity to work much yet at this time in my life, they are funding my trip and I am very thankful to them for it). Tautvydas and Guoda like to go for walks sometimes, just wander around and get a little bit of exercise, and maybe even a little bit lost while enjoying the outdoors before it gets too cold to enjoy them anymore. There is a very tall TV tower that I can see if I walk out of the building where I am staying and onto the street. A person can spot it from many different locations though, where I stay does not have a unique view of this tower. They said on one of their walks they walked in a forest next to this TV tower, and found an animal cemetery hidden in the forest. In Lithuania, animal cemeteries are illegal. They said that some of the graves were simple, with just a picture of the animal next to the headstone. However, other graves were much more elaborate. Guoda said they saw headstones that were obviously quite expensive with pictures of the pets’ heads engraved into the stone, with information such as their breed written on the stones as well. People have evidently spent quite a bit of time and money on their pets and ensuring that this cemetery was hidden. Tautvydas works in a start-up company where people can sell and buy used clothes; I think the company’s name is Vinted. They have expanded to America, so Tautvydas had the opportunity to visit San Francisco to take some classes concerning business at an American University. It is very expensive to live in San Francisco and Tautvydas was looking for the cheapest housing possible since he would be located in San Francisco while he was there. Well, he found cheap housing for San Francisco standards, but he told me that he ended up living in very cramped quarters with a Mexican roommate who hated the cold. Tautvydas basically had a bed and the area around his bed for his stuff. Keep in mind; he is also from Lithuania, a country that gets very cold in the winter. He said that his roommate told him that he got cold very quickly, so he needed to close the windows before he went to bed so he wouldn’t be cold at night. Tautvydas said he would be laying there sweating because obviously he was more used to the cold than the other guy, but he never said anything about being too hot for some reason. He said that for the price of that tiny space he lived in in San Francisco, he can rent an apartment in Vilnius for less. I think that you could rent an apartment almost anywhere for less than you can rent one in San Francisco. (As I continue to stay with Tautvydas and Guoda in Vilnius, I will write more information about my experiences that relate to them or stories they have told me). Today (I say “today,” but I wrote this yesterday) I was out in the city having lunch at some sort of Greek food restaurant, and realized I was running out of Litas. I had a flat-bread filled with some sort of vegetables (I think – it was called something like Hot, Spicy and Crispy. It was not spicy, but it was good) and a drink. I used some internet from a café across the street because I realized that on Couchsurfing I had told this guy we could get together and talk a little in Vilnius since I had found other housing options in Vilnius, and I had not contacted him. It turns out that tomorrow he is going to Venice because he has a rich friend who basically bought his airplane ticket and didn’t give him much of an option. Not that he complained much either. So we got together for coffee and a walk today, and I spent about two hours with him just talking about whatever came to mind. Muezz is from Sweden. Often when I tell people I am part Swedish, their first response is, “That’s where the blonde hair comes from isn’t it?” I mean, that probably does have something to do with it, but it is not the only determining factor of my blonde hair. Also, I don’t see why people feel like they need to say this because it is literally said every time I mention anything about being Swedish. I mean, EVERY TIME. Does it make people feel smart if you tell them you are part Swedish, they see you have blonde hair, and immediately make an assumption? I really don’t understand. Let me tell you what Muezz looks like. He is about my height, and very dark. I mean black hair and darker skin than you would expect from most European countries. I know he is only one person and could be an exception, but I had the opportunity to meet his friend from Sweden too. His friend was shorter than me with hair as dark as Muezz’s but with lighter skin. My father, who has traveled extensively, said that when he went to Sweden he found that yes, the children are very blonde. However, he said that what he saw and learned was that most Swedish people only have blonde hair probably until they reach their mid-teens. (I am not sure of the exact age). Then their hair starts to turn dark, and it gets very dark. So, next time you look at a blonde who is twenty or older, and they tell you they are part Swedish, it is probably safe to assume they are probably part something else too for the blonde to stick. This is not to say that no Swedish people are tall and blonde because there definitely are, I think I am saying this more to make a point that people jump to conclusions rather quickly. After speaking with Muezz and his friend, it sounds like there are quite a few Swedish people who come to Lithuania to study. Many of them are located in Kaunas, and apparently the guys are very concerned with the other Swedish men stealing their girlfriends or ex-girlfriends. In Sweden they have a sort of student loan that I don’t really understand. It gives the student funding for six years (I don’t think an excessive amount of funding), and for six years the student can travel to another country to learn languages or study whatever their faculty (like a major) requires, within reason. I was told also that if there was a country in Europe that has a language as their official language, that they cannot study this language in another country, they have to study it in Europe. For example, if a person wants to study English, they have to study it in the United Kingdom; they can’t go to the United States. We also tried to understand from each other the differences between Swedish, Lithuanian and American universities, but each one is slightly different from the last, and I have the feeling that unless we talked to someone who had experienced all three, we will not fully understand how the universities from the other’s country worked. They have credit hours they have to fulfill each semester. It is not done in classes like ours, but they have to fulfill these hours to get the credit. I don’t understand it because they don’t have to go to the lectures; it is that the administration thought they needed to study that many hours to pass the exam, so those are the hours. In addition, their area of study takes up all four years because the amount of credit they receive in four years is the amount they need to complete study in one faculty. Muezz said that in Lithuania the lectures you have to take for your faculty are already set. There is no leeway to choose something that is still in the faculty but might interest you more (like in American universities when you have some elective courses in your major). In Swedish universities, I understand that they still run on this faculty system, but they have the leeway of the American universities that allow students to pick some of their classes. Muezz said to me that whenever he talks to an American, he feels like they are trying to sell him something. The way we choose our words where something is a certain way, or someone has to do something, I guess it just sounds like a sale. He said that maybe it has something to do with our consumer culture because we are sort of wired to buy and sell. Maybe it does have something to do with this, I don’t know, but it is also probably a difference in intonation. Muezz mentioned to me that there a videos online that have come up recently that make fun of Americans. He told me an example that someone would ask an American where Afghanistan was located and the American, instead of admitting that they don’t know, would point to an area that was completely wrong, like Australia. The point of these videos is not so much that Americans don’t know geography, but also that they don’t want to admit that they don’t know. It is back to that old belief where America is such a strong and leading country that the people from it can’t look like they don’t know something. I don’t know how prevalent this mentality was, or still is in America, but from my point of view this is a mentality that existed more before 9/11. When Muezz saw his friend from Sweden across the street, we went over and said hello. That’s the first time I have ever heard the Swedish language spoken and I am sorry to say I don’t know anything about it. It sounds complicated enough, although I don’t think there are any cases. Muezz’s friend was up from Kaunas with his Lithuanian girlfriend. His girlfriend is apparently a quarter Russian with both friends and immediate family living in Russia, but she does not know Russian at all. They are both in Kaunas for Med-School, but it seems that this city does not interest people as much so they wanted to get away for the day and come to Vilnius. Muezz has been going to the gym twice a day for the past month apparently. He said it is because he has time, and he is also in-between jobs. He is also writing a fitness blog. He says many people come up to him on the street and ask him what he does to look like he does, and they are not satisfied with his answer that in fact he still eats meat and potatoes together, and that he eats late at night. He told me his opinion on the fitness level of Lithuanians in comparison to his own country. People in Lithuania are not fat like Americans or Swedish people when they get fat. (He has not yet been to the United States, but he says parts of the exercise culture and mentality seem rather similar). He says that many Lithuanians in his opinion are “skinny-fat,” a term you may know if you enjoy going to the gym and see skinny people who don’t. In Muezz’s words, when Lithuanians are young they think they look good so they don’t feel the need to work out, but soon they start “sagging” because they don’t have muscles to hold anything in place and then they want to work out. If you are driving down the street in Sacramento, California for example, there are huge box gyms that you can see standing next to the road. When these gyms are open, there are always people in them because American food makes people fat, and then all of our commercials tell us we should be skinny and work out. In Sweden it is apparently the same way. There are gyms everywhere, and they are always full. Walking down the streets of Vilnius, I have not seen one gym. They do have gyms, but Muezz tells me they are really expensive in comparison to the income that these people earn. Edit: I spoke with my host Guoda after she read this post. She disagrees with what Muezz has told me, and I would like to go out on a limb here and say that I believe her more since she has lived in Lithuania her whole life, and he has only lived here a year or so. Guoda says that many people in Lithuania like to work out. Maybe not in the gym (for example I see many people jogging or riding bikes). In every culture there are people who like to get exercise and people who are not as interested. I think that Muezz, perhaps like myself, must be used to a culture that advertises exercise and having in shape bodies so much that it is hard to adjust to see the values of a different culture. I understand that Muezz has at least three brothers. I did not ask him how many siblings he has, but he spoke of three. They lived in Beijing when Muezz was in high school, so when Muezz graduated high school he decided to move there for a while. I think he lived there for six months. When he moved there, his brothers moved away. I know one moved to Tokyo, and one moved to Ukraine. He didn’t say much about his time in Beijing, but afterwards he moved to Tokyo for a year as well too. He said that he really enjoyed Japan, but the biggest problem he had with their culture was their bad communication. He said this is one reason he likes Americans because we don’t take a year to know someone before we are comfortable opening up and talking about something more interesting than surface information. Now after Japan, Muezz is in Lithuania. He told me that he plans to stay here for three years and I believe he has already been here for about a year and a half. He is trying to learn Lithuanian because he said he will not live in a place for three years without at least trying to learn the language. Overall Muezz was a very interesting person to spend some time with, and I always love meeting new people with their own life experiences. I think we will meet again for coffee or for a walk or just to hang out when he returns from his short jaunt to Venice.